Perfect book to prepare preschoolers for "big" school. First day of school, new experiences and making friends play centre stage for this book for the pre-school age. It is Maddie's first day of school and she has everything ready – her uniform, shoes, socks and hat. But there is one special thing that Maddie can't leave behind – her blanky! 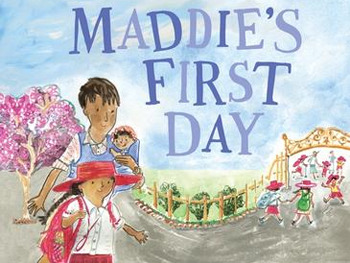 Award winners Penny Matthews and Liz Anelli team up to bring us this wonderful picture book about the excitement of going to "big" school for the first time. Liz Anelli previously lived and worked in England but now resides in Newcastle, NSW. She has a huge passion for drawing and keeps rows of sketchbooks in her studio. In 2017, her book Desert Lake: The Story of Kati Thanda-Lake Eyre (written by Pamela Freeman) was a CBCA Notable Book and was short-listed for the NSW Premier's Literary Award, NSW Premier's History Awards, the Environment Award for Children's Literature and the Educational Publishing Awards. Her last book with Walker was Our Stories: Ten Pound Pom (written by Carole Wilkinson).